Augmented Reality and app development hold immense promise for businesses. Check out this post to discover the top 10 AR business opportunities. Augmented reality development has become the mainstream for businesses today. This is because AR technology can be applied towards marketing, gaming, entertainment, fashion, art, education, and almost any other business domain. In fact, this technology is getting more improved day by day, combining real life with super-imposed images or animations through graphics, smell, sounds, and haptic feedback. According to Statista, the total number of active AR and VR users is forecast to reach 171 million by the end of 2018. 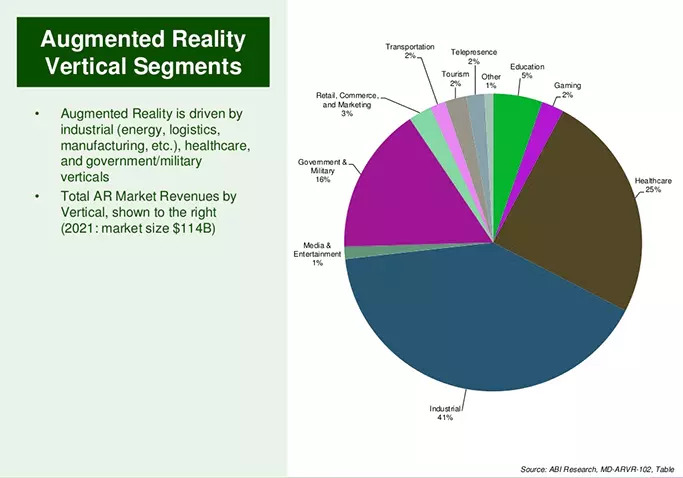 Moreover, the global augmented reality market is expected to grow significantly to about 90 billion U.S. dollars by 2020. As per the same source, revenue from Augmented Reality app development is projected to be three times as high as that of VR by 2020. In 2022, AR hardware device shipments are projected to reach an estimated 68.9 million units — in comparison to the 45.6 million VR hardware devices. In this blog, we will discuss how Augmented Reality and mobile app development can bring many different business opportunities. Augmented Reality development opens up various business possibilities for marketing domain, and if used creatively, it can generate more loyalty and commitment for the brands and their products. Suppose you are walking around the store with a smartphone in your hands, seeing the price and features of the products you want to purchase, along with special offers and discounts for them. With Augmented Reality mobile application development, it can be more effective and fun for clients. Augmented Reality development and marketing for kids has even more interesting options, such as turning the mall into an amusement park where they can complete tasks to win something and interact with virtual characters. Ultimately, it provides more engagement to users. First of all, try to imagine how interesting lessons would be if teachers used an Augmented Reality app to explain various historical events. Or, image how exciting any boring subject would become with the ability to see it in action. In fact, schools are already becoming digitalizing lesson plans, using computers and mobile applications in the classroom. Now, think of what you could do with Augmented Reality app development. For instance, students can walk through a human cell or see a 3D galaxy on the screens of their tablets or smartphones. Whether it be any subject, including history, biology, science, etc. everything can be illuminated with the help of Augmented Reality. When it comes to hobbies, sports fans are probably the most passionate users. Some like to enjoy the game in person and support their favorite team in the stadium, while others prefer to watch the game from the screen of their TVs or smartphones. With Augmented Reality development, you can get live statistics, including the trajectory of the ball and its speed in the stadium. Augmented Reality development can remove the barriers when it comes to collaborating with international business. This can help with translations, if you meet a colleague abroad, and creates a common space — even if you are thousands of kilometers away from each other. You can also record entire meetings and go back later and save everything written onto virtual boards. The possibilities of Augmented Reality app development are almost endless. They will enter into almost all spheres of our life, starting with social networks and ending with electronic commerce. However, it will go beyond that, and soon we will see many incredible applications with AR. The problem faced by people while purchasing furniture is that they have almost no idea how it will really fit inside. This is part of the reason people often hire visual designers who can show the final image. With an AR mobile apps, you can place any furniture in your apartment without having to physically take it there. There has been a number of such Augmented Reality apps that allow you to do that. You can even scale the furniture and change the colors, so you can choose the perfect sofa for your living room. The use of Augmented Reality makes your online shopping experience more real and personable. Without visualization, statistics and analytics are actually very hard to understand. That’s why we have these tables, circular charts, and infographics. All this help us to see the information and to present not only pure numbers but something visual. Augmented Reality development can be a great tool when it comes to showcasing data and sharing it with people. Today, all companies need it. AR is all about the interaction between people and the exchange of information. It is a good way to add dimension to your data and bring life to it. Medical applications are some of the biggest trends at the moment, being the second most popular type of application after games for smartphones. Augmented Reality can provide additional possibilities for users of medical applications. This is because doctors will be able to see a 3D image of an MRI while talking to patients or analyzing their movements. Measuring objects and walls are not the only things that Augmented Reality is capable of when it comes to amazing interiors. With AR development, you can also paint the walls of a certain color and show how the room will work with a painting on the wall. These applications should also be able to calculate the necessary materials and labor costs. We can say that visualization is a very important part of any project, and Augmented Reality apps are all about making things visual and allowing users to see them from all angles. It can give engineers the ability to place their prototype on a board table so that everyone can understand the subject. Similarly, with AR, you can walk through a construction site and see the sections colored to indicate when each phase will end. This could help engineers share their vision of the project with others, which would make the interaction more clear and productive. Augmented Reality app development can give you more information about all the places you want to visit, and the maps combined with an AR guide can give you a great experience in exploring the city. Moreover, museums can also take advantage of this technology by telling their visitors more about the items they see and giving them life. 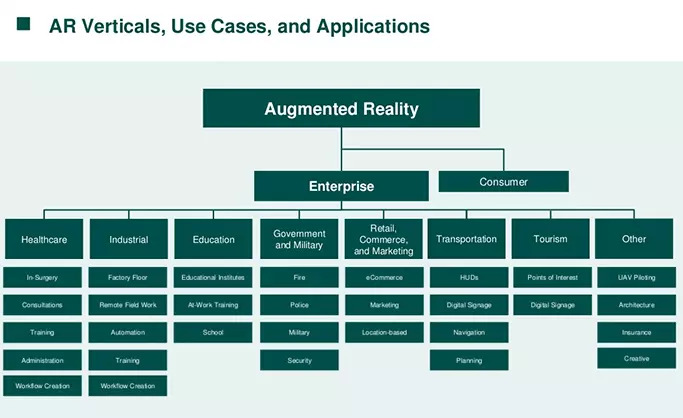 So far, we have seen the various business opportunities for Augmented Reality. This would surely boost your business revenue to several times more than expected in 2018.
augmented reality ,augmented reality advantages ,augmented reality app development ,augmented and virtual reality.